One of the benefits about my recent wardrobe overhaul is that I've discovered a few things I've not worn for a while. This red dipped hem shirt was absolute favourite of mine for a while but soon got shoved to the back of my wardrobe as soon new stuff came along. This black bow tie was also shoved in a box of belts and soon forgotten about. It's been quite nice to have a good look through my things and decide what I want to keep and what I can live with out! My Filofax Giveaway ends tonight so it's your last change to enter! Love finding old clothes that I haven't worn in ages its almost as good as getting new clothes! Gorgeous shirt I really love the colour! 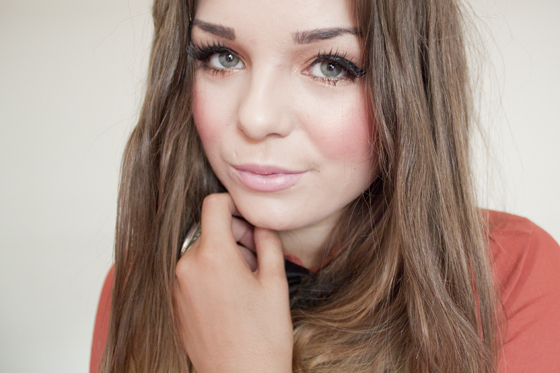 Such a cute outfit, love the colour of the shirt! I love this! I can never tie ribbon into neat bows and have never found anywhere selling ready done ones, disappointed that it's old and they won't have it anymore, really want one. You looks so feminin and romantic!! You look so sweet. I keep forgetting I have certain garments and when I come across them, they feel like new! I love this shirt ! The color is gorgeous and the bow is really cute ! This look is so cute, I love the bow you are wearing. Love the colour of the shirt! So amazing finding things you forgot you had. I did exactly the same thing with that shirt! I tend to wear my favourites in a cycle and it gradually got pushed back to the far left and right. I found it a few weeks ago and was like ahhhh I loved you so. Love it when that happens! The shirt and tie combo look amazing, the colour really suits you. I love how the bow matches with the rings and leggings. I adore the colour of the blouse. 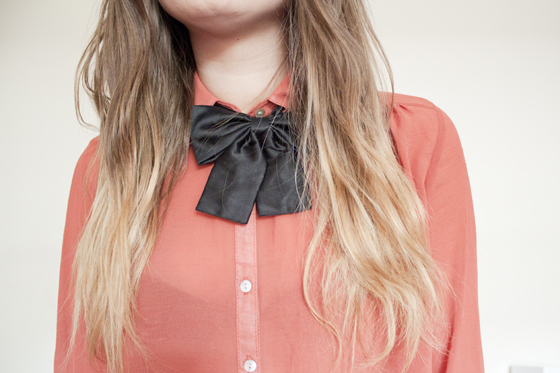 I love your top and your bow! Lovely shirt - looks perfect with the bow tie! i love the bowtie!! its adorable! I love bow ties, this one is so cute! 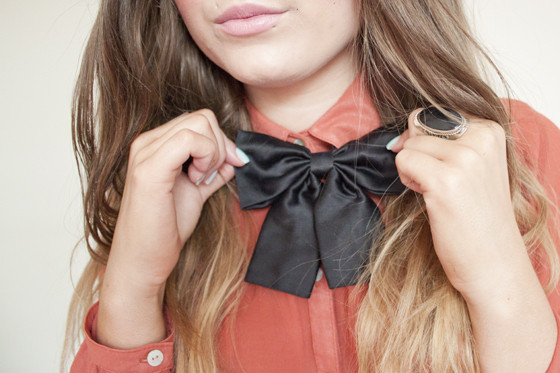 The bowtie accent is absolutely darling! i like hair styles i want to say that these are the personality maker thing and i want to contribute my life to hairstyles these things.i like them very much.i like hairstyles i like some feboulous type of hairstyles because these are one of those hairstyles which can make the personality of the man i like them very much.i want to say that hairstyles is the thing curly hairstyles which can make the man or woman more beautiful. I LOVE THAT BLOUSE!! And sheer blouses are quite in style this season, so that's perfect. :)! That shirt & tie combo is perfect. Very pretty. I love the second last picture. I love discovering old things that haven't been worn in ages. Oh my god, this is unreal - noticed my primark bow tie the other day and was planning on wearing it with this shirt too...! Ridic! There's nothing better than finding things you've forgotten about in your wardrobe and coming up with new ways to wear them! love this outfit, the bow looks amazing. still adore that nail polish! 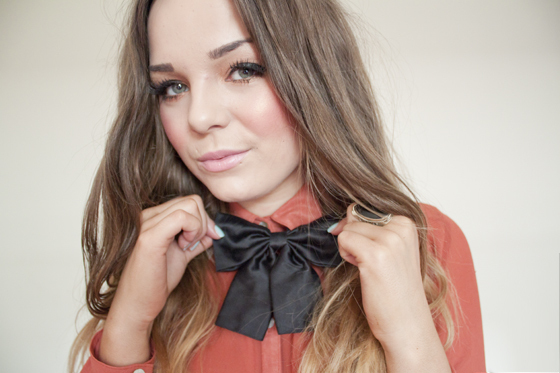 Oo I have that shirt, it looks cute with the bow tie :) and sky blue and burnt orange is such a nice colour combo! Love re-discovering old things! The shirt and bow tie look great together, also a big fan of your triangle ring! I love this look. That bowtie is to DIE! This is different and I love it, those leggings are fancy! here fashion bug is I want to introduce the fashion world new fashion of shirt that have good looking, you can wear it with vintage wedding dresses dress and jeans and other dresses.